Leopard 46’ Owners Version 2011-12 (rec’d as new boat from Leopard Ft.
Lauderdale, Florida April 2012 with all factory options). Used only 5-6 mos. per year. Has been stored in boatyards on hard in Trinidad and now Grenada last 4 years). List of equipment: 3 Queen berth cabins 3 heads w/ glass enclosed showers (2 electric) 2 54hp Yanmar engines (1,120 hrs) 2 Flexafold props 9 KVA Northern Lights generator (927 hrs) Xantrex high output 150amp battery charger/inverter 4 Lifeline AGM batteries (new in 2018) Link-Pro Xantrex house battery monitor 2 electric winches at helm A/C -3 zone reverse cycle Watermaker 110V 35 gal per hour Raymarine E97 touch screen plotters in both Nav and Helm stations 48 mile Raymarine color digital radar All Raymarine instumentation, VHF at helm and Nav station, AIS transmitting, 2 depth sounders plus fish finder. Icom portable handheld rechargeable VHF radio ACR new epirb Icon 802 SSB with Pastor 3 interface for offshore weather 2 banks of Sunware solar panels with 2 MPT Blue Sky regulators Eclectic D-400 Wind generator with custom stainless steel mount North asymmetrical spinnaker and sock Washer/dryer Microwave Samsung 32” wall mount swivel tv with enhanced sound system and DVD player Sony sound system, disc, radio tuner, Apple or Android compatible Force 10 3 burner stove Magma gas BarBQ (mounted on stern rail) 2 frig’s 1 freezer (1 frig in cockpit)with custom Sea-frost electronic thermostats showing box and plate temperatures with 3 speed controls Scuba dive gear for two Custom luxury cockpit cushions 12 ft.
AB Dinghy 25 Hp Yamaha outboard motor (new motor 2015). Double Down is being sold as a complete boat ready to cruise with tools, extensive list of spare parts for all systems, complete galley dishes, pots, glasses,cutlery, linens, bed covers etc. This boat can be boarded and sailed away as it needs nothing to cruise. 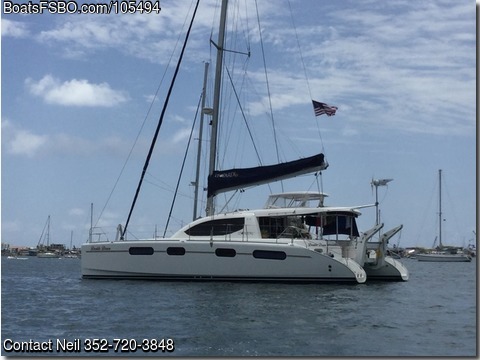 Priced to sell by owner $495,000.usd CONTACT: neiljeri@gmail.com We are on board in St.
Martin now but headed south to Grenada in Mid April to haul in Grenada mid May 2019.